Farm Stand Sign: "If you like spinach, you'll love amaranth!" Thought Number One: "Ooo! 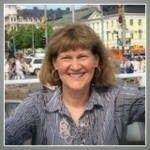 Something new!" 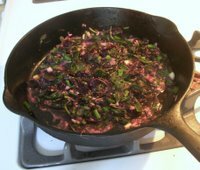 Thought Number Two: "Weekend Herb Blogging" at Kalyn's Kitchen! 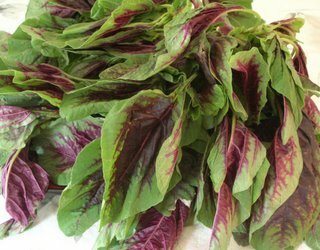 According to Wikipedia, amaranth greens go by lots of names, chinese cabbage, hinn choy, yin tsoi, callaloo, tampala and quelite. 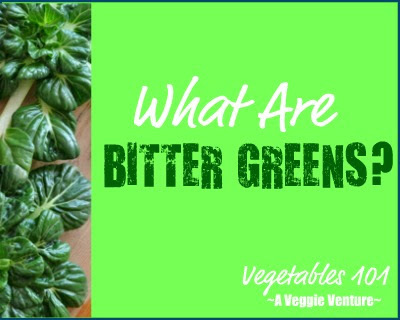 In my typical online and offline sources, there are virtually no * recipe * references to amaranth greens. Those I found indicated only, "Peppery like arugula or radicchio. Cook like any green." And so I did! Just garlic and ginger. The red color remains rather than washing away so it would be a great bed for broiled or grilled fish. And it doesn't cook down as much as spinach. I read that the beautiful purply-red color will withstand a soup. I did make a batch, but with chicken stock so it didn't survive last week's three-day power loss. But when it was poured down the sink, it was an awful-looking green-brown muck, not red and NOT pretty. NUTRITION NOTES ... Like quinoa, amaranth greens are high in protein and a complete protein at that. NEXT TIME ... Amaranth is some tougher than other greens so next time, I'll cut it into thin strips before cooking. I'd also stir in some sour cream or Greek yogurt like Ontario Greens. FROM THE ARCHIVES ... Leafy greens are popular here. Just check this section in the Recipe Box. A favorite way to hold fresh greens for cooking later is here, in Greek Greens. In a large skillet, heat the broth over MEDIUM HIGH. Add the garlic and ginger and cook for a minute. Add the greens, in batches if needed. Cook until soft, stirring often. Near the end, add the green onions. Season to taste and serve. Interesting!! I would love to taste this, but I haven't seen it at my farmer's market. There's one farmer I'm getting to know a little, maybe I'll ask him if he ever grows it. I've never seen them either. They're beautiful! Thanks for posting that! Well now, that's a new one to me. Although I have heard of callaloo before, I can't say that I've ever tasted or seen what to do with it. I'll have to keep my eyes peeled. I am pretty sure that is the same amaranth that flower gardeners grow as a decorative plant--which means, my mother and grandmothers grew it for years and years, just because it was pretty. Kalyn ~ It's worthing watching out for. Sher ~ Isn't it gorgeous? Erika ~ My nearby intl grocery has canned callaloo, maybe I'll check it out, too. Barbara ~ It is THAT pretty, just to grow! I love the idea that it's "historical". And just yesterday I noticed that the sun garden has volunteer swiss chard which I put in last year just because IT was pretty! Most Asian markets have it. It's often labeled "Zen Choy"
Try throwing it in soup!